Cantor at Kremenetz, Volhynia, in the sixteenth century. In 1595, after recovering from a terrible malady which ended in a trance, he applied himself to utilizing certain material for a haggadic commentary upon the Prophets and the Hagiographa, with a Judæo-German translation of difficult passages. 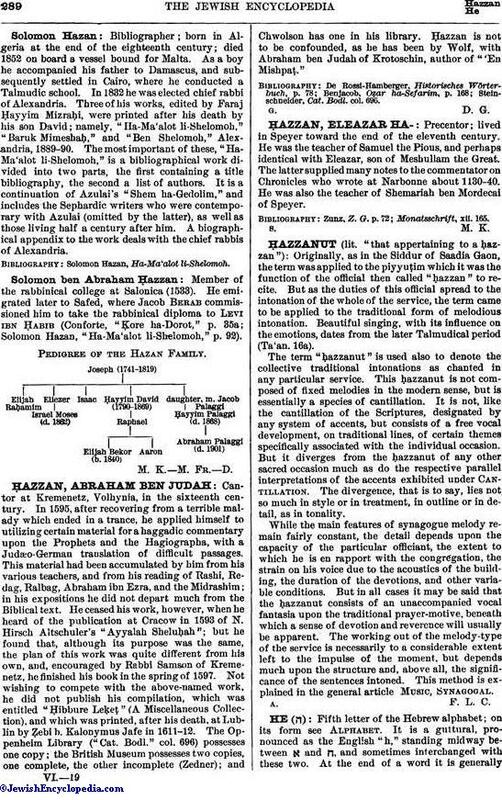 This material had been accumulated by him from his various teachers, and from his reading of Rashi, Redag, Ralbag, Abraham ibn Ezra, and the Midrashim; in his expositions he did not depart much from the Biblical text. He ceased his work, however, when he heard of the publication at Cracow in 1593 of N. Hirsch Altschuler's "Ayyalah Sheluḥah"; but he found that, although its purpose was the same, the plan of this work was quite different from his own, and, encouraged by Rabbi Samson of Kremenetz, he finished his book in the spring of 1597. Not wishing to compete with the above-named work, he did not publish his compilation, which was entitled "Ḥibbure Leḳeṭ" (A Miscellaneous Collection), and which was printed, after his death, at Lublin by Ẓebi b. Kalonymus Jafe in 1611-12. The Oppenheim Library ("Cat. Bodl." col. 696) possesses one copy; the British Museum possesses two copies, one complete, the other incomplete (Zedner); and Chwolson has one in his library. Ḥazzan is not to be confounded, as he has been by Wolf, with Abraham ben Judah of Krotoschin, author of "'En Mishpaṭ." Steinschneider, Cat. Bodl. col. 696.